Kevin’s science test is coming up. Unfortunately, his study partner called and can’t make it. Marko, a magical pencil, comes to the rescue by taking Kevin to Marko’s Super Science Station. Kevin prepares for his test by first learning the details of lab safety. Next, Marko introduces Kevin to his friend Lumina, an animated light bulb. Lumina shows Kevin how to remember the 6 steps of the scientific method: Question, Gather, Hypothesize, Experiment, Conclude, and Report. It’s time to move on to the Matter Learning Center to gain an understanding of atoms, the particles of an atom, molecules, and states of matter. Eventually, Kevin explores the properties of matter that include melting point, boiling point, conductivity, luster, color, odor, density, hardness, magnetism, and texture. Kevin also discovers the differences between physical changes and chemical changes as well as how mixtures differ from pure substances. Surprise! Kevin’s chair blasts off to the Electricity Learning Center to learn about electric circuits and how opposite electric charges attract each other. Kevin and Marko then move on to the Magnetism Learning Center where Marko’s friend Terra, an animated globe, helps Kevin understand the poles of a magnet and build a simple electromagnet. Eventually, Kevin and his friends visit two more centers to help Kevin prepare for his physical science test. In the Motion and Gravity Learning Center, Kevin explores gravity, mass, distance between objects, velocity, acceleration, inertia, friction, resistance, and more. At last, everyone explores the Energy Learning Center to learn about the different forms of energy that include heat, electrical, sound, chemical, mechanical, and light. 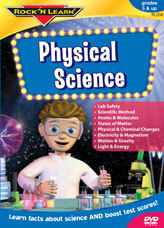 By the end of the main section of this Physical Science DVD, Kevin has enjoyed learning important concepts about physical science. In the Bonus Section of this DVD, Kevin and Marko practice a physical science test with questions similar to the ones Kevin will see on his test. This section helps prepare students for state-mandated tests that have multiple-choice questions about physical science. Marko has a special website where students and teachers can download a sample test and obtain free study material. Developed for grades 5 and up, this DVD provides an entertaining review for students at all grade levels. Marko the Pencil is played by actor Vic Mignogna, Best Actor 2007, American Anime Awards and voice for many popular video games. Other notable voice talent includes Luci Christian, Kira Vincent, and Caitlin Glass. Get started immediately by helping your child or your students brush up on physical science knowledge and learn some really great test taking skills. There are also free study materials that compliment this DVD which can be downloaded from the web site. Here's an exciting way to learn important facts and get ready for a life science test! Marko the Pencil and his friend Bailey take learners on a fascinating journey to Marko's Super Science Station where it's easy and fun to grasp science concepts and boost test scores. 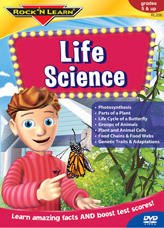 This science DVD covers Photosynthesis, Plant Parts, Butterfly Lifecycle, Plant and Animal Cells, Food Chains & Webs, and more! Meets the National Science Education Standards. Physics Songbag songs include Newton's One, Two, Three; Probability; Inverse Square Love; That Old Static Charge; Amazing Spoons, Too Many Photons for Love; Harry the Human Cannonball; Wave Motion and more.